So I've been feeling under the weather the last few days. I woke up monday morning not feeling well and have been stuck in bed that last couple days with a sore throat, dry nose & a bad head ache. Finally feeling better today which is nice, except its gloomy and very rainy out, which doesn't help with my level of energy. I decided to do todays post on pregnancy glow since I feel like I've had zero the last few days! During pregnancy your body goes through so many changes! I always say I feel lucky like my boy is treating me well! But I did and continue to experience some changes to my face and body. Oily skin was a big change which caused acne and blemishes, all normal during pregnancy. Because of the extra hormones, it causes your oil glands to produce more oil which leads to breakout. I had to completely change my daily routine to help prevent break outs. 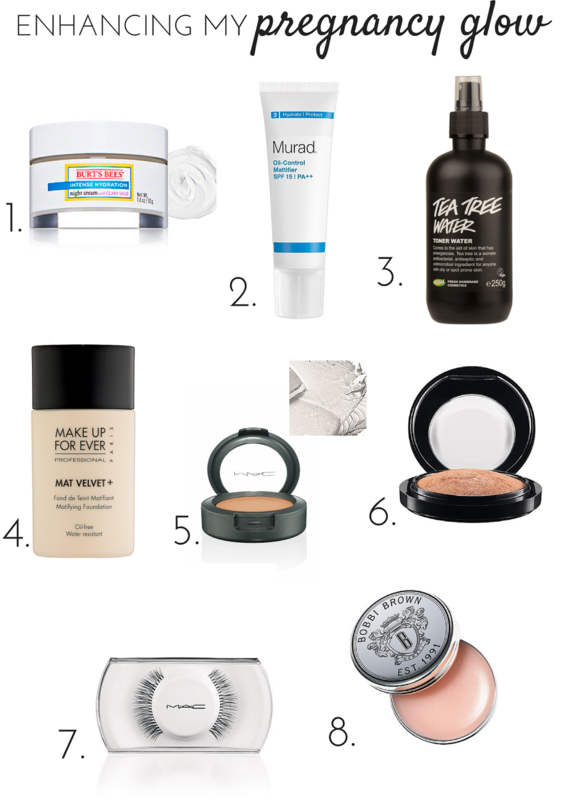 I have found some great products which I absolutely love and that have really helped me control my break outs and achieve a pregnancy glow when that natural pregnancy glow wasn't there. I added links to all the products and where you can purchase them. I hope this helps some of you moms struggling with the same problem. 1. Burts Bee's: Intense hydration night cream - Every night I apply this hydrating night cream, which leaves my skin feeling soft and smooth every morning. It absorbs quickly and it is a non greasy formula. 2. Murad: Oil-Control Mattifier SPF 15 | PA++ - Okay, this is seriously one of my favorite products!! I have dealt with oily skin for quite some time now but when I got pregnant it got worse. I discovered this product on one of my shopping trips. I absolutely LOVE it!! I do my daily morning routine and then apply Murad as my moisturizer. It controls oil for up to eight hours, reduces shine and gives you a matte finish. Plus it has SPF so it protects from sun damage! It is a great product to use during pregnancy, it is Paraben-free; sulfate-free; phtalate-free. 3. Lush: Tea tree water - This is another great product! Before I apply my murad moisturizer, I apply this tea tree water toner. This toner helps brighen up oily, dull and spotty skin. All natural ingredients; tea tree, juniperberry and grapefruit waters, which help balance skin tone. This product reduces redness and clears your face of oils without drying. 4. Make up forever: Mat Velvet - I love this foundation, which is shine controlling, oil free, water- resistant and complete coverage. It gives a nice mate and powdered finish - helps to hide any imperfections. 5. MAC: cream color base (luna) - This is a new product I just purchased - which I love to enhance my pregnancy glow! After applying my foundation, bronzer & blush, I add the MAC cream color base to the top of my cheek bones as a high lighter to give my face a bight finish and glow. 6. MAC: 'Mineralize' skinfinish (soft & gentle) - Also a new product I just purchased. After I apply the cream color base to the top of my cheek bones finish it off with this skinfinish adds some extra highlights to your cheeks and then I dust some under my brows. 7. MAC: Eyelashes - The one thing I was not blessed with was eyelashes! Lucky for me MAC makes great eyelashes! I've tried every product on the market to help my eyelashes grow, I even got eyelash extensions for a period of time which just damaged my eyelashes even more. Then I would just curl my eyelashes daily and apply massive amounts of mascara which didn't do anything. So I find it easiest for me to just apply eyelashes daily. I like MAC eyelashes the best. If you take good care of them they can last you up to two weeks! The ones above aren't the exact ones that I use be closest as I couldn't find the one I use on the site- I use Lash B74 for every day use. Which give them a natural look. 8. Bobbi Brown: lip balm - Last on my list is this Bobbi Brown Lip balm. the last thing I need to enhance my pregnancy look. This balm is made with wheat germ and olive oil. It is non- greasy and moisturizes my lips which is perfect now during the change of weather and helps my lips from chapping.